In November, I visited the Shark Valley Visitor Center and nature trails with my mother and husband, neither of whom have ever seen this part of the Everglades before. 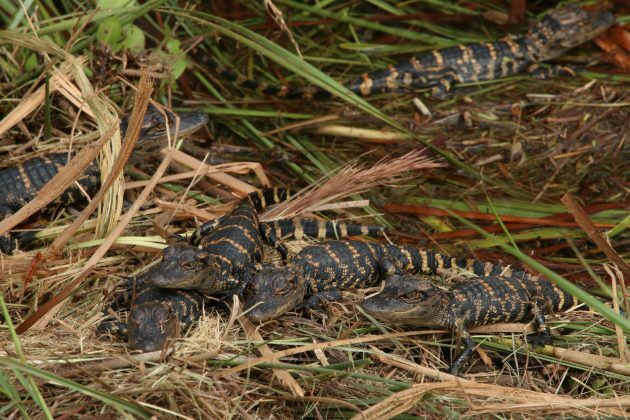 Mom became especially enraptured with the baby alligators we spotted – less than a foot long, they basked in the grass next to their mothers, or crawled atop her back and tail for extra protection. 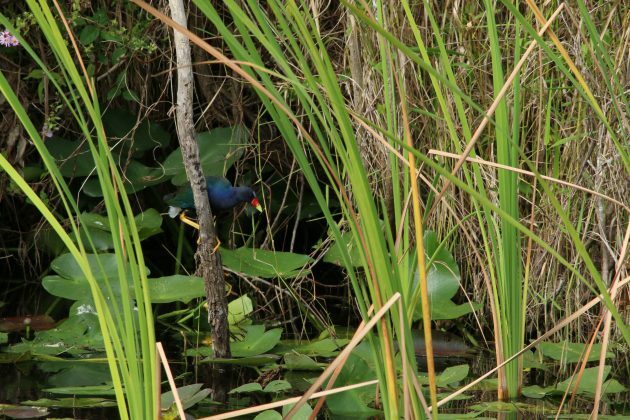 Don’t get me wrong, I loved every critter we observed, from the alligators to gar to turtles, but I remained on the look-out for one species in particular: the Purple Gallinule. Purple Gallinules are what rainbows would look like if reincarnated into a bird. Long yellow legs meet blue-green bodies, all topped off with red and yellow bills and a light blue crown. They are mesmerizingly beautiful, but I’ve never see one outside of the Everglades (though they range throughout the southeast). I so badly wanted to spot their chicken-like forms. The nature trails in this part of the park mainly consist of a paved path bordering a canal, with mangroves and other flood-tolerant trees on the other side. Because water pools here, there are even more plants and animals than other areas of the biodiverse park. An Anhinga spread its wings every few yards or so, White Ibis and Wood Storks and Double-crested Cormorants periodically flying overhead. Luckily for my stress levels, I didn’t have to wait too long. Just a few minutes into our stroll I spied a small bird pop out of the dense understory and land on a leafless branch. The colors were unmistakable: a Purple Gallinule! The species was a life-bird for my mother. Her eyes widened as she peered at the brightly-hued creature in her binoculars. After getting a good look my husband wanted to keep walking, but she couldn’t get enough. I don’t blame her. To me, they are the most spectacular bird in all of South Florida.